Corey Wright is a Senior Fishery Biologist with over 17 years of experience. 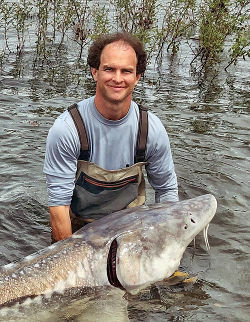 Mr. Wright currently manages multiple projects involving adult and juvenile sturgeon, including broodstock collection, hatchery supplementation, monitoring and evaluation programs, as well as telemetry studies in relation to hydroelectric projects in the Pacific Northwest. He has also led hydroacoustic assessments of downstream migration, timing, and distribution of juvenile salmon. Mr. Wright is technologically savvy in biotelemetry and real-time data transfer systems and techniques, including cellular, satellite, and network data transfer protocols. Mr. Wright has expertise in acoustic (VEMCO, Lotek, HTI, DIDSON, and JSATS), radio (Lotek, ATS) and PIT (Biomark, Oregon RFID) technologies. He has conducted spatial, behavioral, and statistical analyses for these projects using GIS (including 3D spatial analysis), SAS, and SigmaPlot. In the field, Mr. Wright is proficient at various fish collection techniques (setline, trawl, electroshocking, angling, kick-net, D-ring, and stake net gears) for sampling all life stages of sturgeon as well as other species, and has extensive experience with surgical and gastric implantation of transmitters. Mr. Wright is also proficient at the mechanical operation, maintenance, and repair of boats, vehicles, and other field equipment. Mr. Wright completed a BS in Biology and Environmental Analysis from Warren Wilson College in 2001.